t’s official. The Obamacare insurance company business model does not work. UnitedHealth Group just announced they expect to lose $450 million in the Obamacare exchanges and are seriously considering withdrawing from the program in the coming year. There are signs that broad pattern has continued–and in some cases worsened–this year. A Goldman Sachs Group Inc. analysis of state filings for 30 not-for-profit Blue Cross and Blue Shield insurers found that their overall company wide results were “barely break-even” for the first half of 2015. Goldman analysts projected the group would post an aggregate loss for the full year–the first since the late 1980s. The analysis said the health-law exchanges appeared to be a “key driver” for the faltering corporate results, and the medical-loss ratio for the Blue insurers’ individual business was 99% in the first half of 2015–up from 91% at that point in 2014, and 82% for the first six months of 2013. Every health plan I talk to tells me that they don’t expect their Obamacare business to be profitable even in 2016 after their big rate increases. That does not bode well for the rate increases we can expect to be announced in the middle of next year’s elections. And, then there are the insolvencies of 12 of the 23 original Obamacare co-op insurance companies–the canaries in the Obamacare coal mine–with almost all of the rest of the survivors losing lots of money. Because nowhere near enough healthy people are signing up to pay for the sick. We estimate that just over 24 million people were eligible for tax credits for health coverage purchased through Affordable Care Act’s (ACA) health insurance marketplaces in 2015. As of the beginning of March 2015, 10 million people eligible for tax credits had selected marketplace plans, representing a plan selection rate of 41 percent of the population estimated to be eligible for tax credits. By the end of June, 2015, 8.6 million had actually enrolled in marketplace coverage with tax credits, representing an enrollment rate of 35 percent. In recent post at Forbes, Has the Obama Administration Given Up on Obamacare?, I made the point that the Obama administration’s 2016 almost flat enrollment estimate would constitute only a small fraction of the potential market–I estimated less than 40% of those eligible for a subsidy. Now, The Robert Wood Johnson Foundation and the Urban Institute have come to largely the same conclusion–enrolling a total of 10 million in the exchanges, based on historic trends, would mean only about 9 million of them would be subsidy eligible. That would amount to only 38% of the 24 million people eligible for a subsidy. And, don’t forget that the only place a subsidy eligible person can get an Obamacare subsidy is in the state and federal exchanges. They can’t get subsidized commercial health insurance anywhere else. And, I suggested in the same post that such a poor 2016 open enrollment would be way short of the market share required to create an efficient risk pool–having enough healthy people paying into the pool to support the sick at affordable rates. I also argued that such low enrollment rates could never make the new health insurance law politically sustainable. That the Affordable Care Act’s individual market risk pool is so far unacceptable was reinforced by a recent McKinsey report that health insurers lost an aggregate $2.5 billion in the individual health insurance market in 2014–an average of $163 per enrollee. They reported that only 36% of health plans in the individual market made money in 2014–and that was before they found out that the federal government was only going to pay off on 12.6% of the risk corridor reinsurance payments the carriers expected and many had already booked. Because the risk corridor program is revenue neutral, the fact that the carriers in the red are only going to collect 12.6% of what they requested means that the carriers losing money did so at a rate eight times greater than the carriers making money! I have also regularly argued that the reason that the take-up rate among most of those eligible is so low is that the policies are still too expensive and the deductibles and co-pays are too high for other than the poorest. In another recent post, Why the Affordable Care Act Isn’t Here To Stay–In One Picture,I pointed to an Avalere Consulting analysis that showed that while three-quarters of the poorest of those eligible for the exchange subsidies have signed up, only 20% of those making between 251% and 300% of the poverty level had so far enrolled. What did the Robert Wood Johnson Foundation and The Urban Institute find on this count? The uniformity of 2015 marketplace plan selection rates at different income levels across the 37 states using HealthCare.gov is striking. In part, it may reflect people’s judgments about the affordability of marketplace coverage at different income levels. Premium tax credits, cost sharing reductions, and actuarial value levels are the same across the states, so marketplace enrollment data may provide valuable information on people’s willingness to pay for marketplace health coverage. This conclusion is reinforced by several studies that have shown many people who shopped for marketplace coverage did not choose a plan, considered the available options to be unaffordable. When are Obamacare apologists going to stop spinning the insurance exchange enrollment as some big victory that is running smoothly? 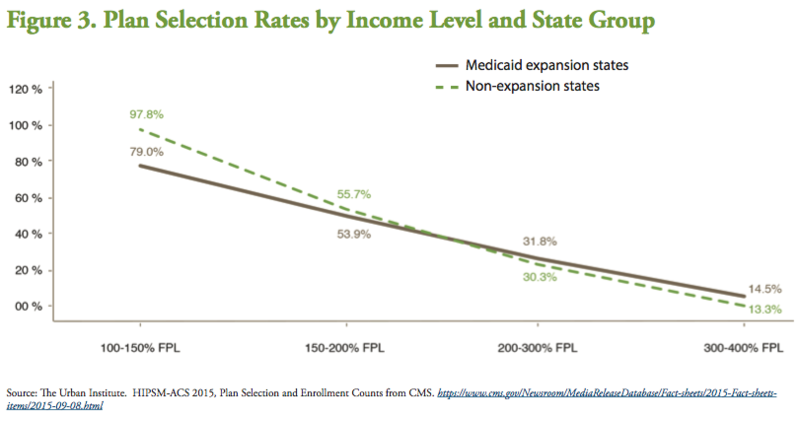 Yes, Obamacare has brought the number of those uninsured down–because of the Medicaid expansion in those states that have taken it and because the poorest people eligible for the biggest exchange subsidies and lowest deductibles have found the program attractive. But that Obamacare has been a huge failure among the working class and middle-class–not to mention those who make too much for subsidies and have to pay the full cost for their expensive plans–has once again been confirmed. How does the Obama administration spin 2015’s unacceptably low health insurance exchange take-up rate of 35% and their projection that it will hardly grow in 2016? This open enrollment is going to be a challenge but having fewer uninsured Americans to sign up is a good problem to have. The arrogance in this spin is astounding. When will the denial, over the real shape Obamacare is in, end? The Robert Wood Johnson Foundation and Urban Institute findings have now given additional credibility to the very same conclusion many of us have been trying to make since the Obamacare launch: The Obama administration has NOT been so successful in enrolling those eligible–they’ve got more than 60% of the group remaining! If the Obama administration signs up the 10 million they are estimating they will sign-up during the current open enrollment, based upon the historic number that are subsidy eligible, they will have less than the 9 million of the 24 million RWJF and UI estimate are in the potential exchange subsidy market–just a 38% success rate. And, that is nowhere near where they will have to be to make these risk pools sustainable for the insurance companies or politically sustainable in the country. 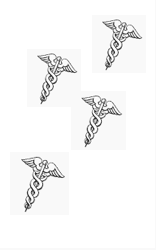 Or keep the likes of UnitedHealth Group in the program. How can Obamacare be fixed? First, the Obama administration can improve, but not completely solve, their Obamacare problems by dramatically revisiting their regulations so as to give health plans the flexibility they need to better design plans their customers want to buy. But that would only be a first step. Robert Lazewski is a principal at Health Policy and Strategy Associates. Leta me add one more example of what let’s call “selective protectionsim” in health insurance. The ACA originally proposed a $15 billion reduction in subsidies to Medicare Advantage carriers. But it never happened. I sell Med Advantage policies and there have been no premium increases worth noting. It’s clear the concept that health care needs to be a profit generating business for investors is wrong headed. We don’t expect public transportation to be a profit generating necessary public good and we support it with tax dollars because that’s what works. The way to solve poor enrollments is a universal tax mandate, either at source income or VAT or combination – with provider price controls. We could also have affordable co-pays to help the funding. Single-pay gets closer and closer as all other methods fail. Health care policy is the new “Big Muddy”. Gee Bob, let’s bring back mini-meds and other junk insurance – that’s affordable, until you need it. Your chief complaint seems a tad naive given your health wonk standing on the nature of ACA challenges and admitted flaws. Let’s not forget the special interests authors of the bill presented to the Senate Finance committee in 2010. That HR 676 never saw the light of day was evidence of the power of the health plan community. You can do better. Your prescription is a tad ‘light’. It’s ironic that physicians and health care providers keep getting hit over the head with the concept of “value” when most Americans find very little value for their money in these insurance programs. Secondly, the clarion call from the administration is the number of insured. That’s all well and good, but the name of this law is the “Affordable” Care Act, and I think many Americans would not agree.